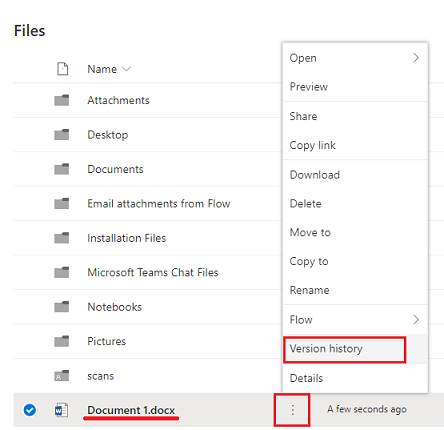 Files stored in OneDrive and SharePoint have a feature called Version History that allows users to see what was changed on a document, who changed the document, and allows a restoration of a historic version. This document outlines this feature and its use. Users can view the Version History on most OneDrive and SharePoint documents. 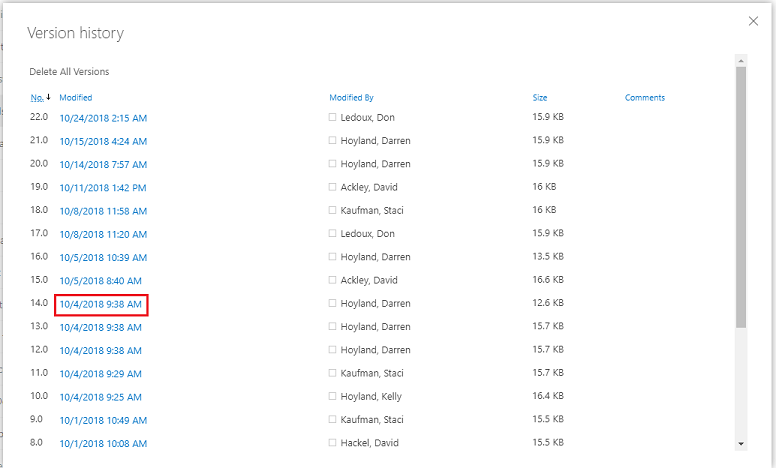 Within OneDrive or SharePoint, located the file you'd like to check the history for. Click the Show Actions icon (three dots) and select Version History. You will now see a new window with the Version History data. This will tell you the both the Modified date and the Modified By person. In OneDrive, click the Version number. In Sharepoint, click the Modified date. If prompted, allow the required application to open. This will depend on the document's file type. Once open, you will notice two things with the document: It is specified as a backup version/Read-Only and there is the option or Compare or Restore the document. *Please note that only Word documents currently have the Compare option. Comparing is currently only available for Word documents. Selecting Compare will create a new document with a section for the backup document and a section for the current document. You can then manually view the differences between the documents. In the Compared Document section, users can also combine the two documents. This makes it easy to copy/paste between the documents to create a new one. When closing the document, there will be a prompt to save or not. Those who have created a Compared Document will need to click Save. Those who have not created a document will click Don't Save. Restoring does not delete the current version of the document, it simply saves the old version as the new version. The example below shows that version 4.0 has been added. This version is exactly the same as 2.0. By restoring the document, the older version is still available for review if needed.